The M-4 “Arizona” game set is a laser tag gun that doesn’t have an analog in real life. 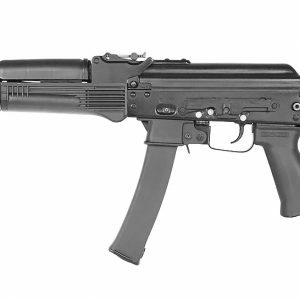 The body of this laser tag gun is taken from MP-5 “Kurz” airsoft model. This gun is made from ABS-plastic. that’s why it weighs only 1,6kg. 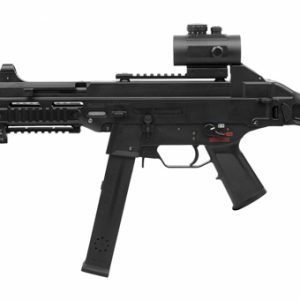 It has a folding stock, so a player can make it more compact. The tactical grip is integrated to the forearm. RIS system on the top of the gun allows you to mount different devices. The compact optical system allows you to shoot up to 500 ft (150m). So, this lightweight, compact laser tag gun is the ideal tagger for close combat in buildings. The model uses lithium battery as a power source with a capacity of 2,2 Ah, providing up to 30 hours of battery life. Reload is done to the breechblock. Safety switch performs the power-on function. The charging connector is located in front of a magazine.